A former South Omaha Altar Boy went to South Vietnam. Pachyderms is a military fiction novel written by Danny Buoy. Dan Coobat received a military deferment for college in the early 1960s, and when he matriculated with a degree in English, he enlisted. With his academic background, he was assured a position in communications, but was actually assigned to Advanced Infantry Training School. After that, he ended up at Fort Benning, working with Specialist 5th Class Carl Copelet in Flight Operations. Dan hadn't considered Vietnam as a likely destination when he signed up, but the 312th Battalion would be deployed there about six months after he became Copelet's trainee. Dan and Copelet helped set up the Battalion's new home in Bear Cat, a barren space surrounded by jungle, with a most incongruous yellow mobile home announcing the presence of the Fifth's Commanding General Bosebaugh. Danny Buoy's historical military novel, Pachyderms, is an enthralling and engrossing coming of age story set in Vietnam in the late 1960s. Dan and Cope are marvelous characters, and their initially tense relationship blossoms into a strong and enduring friendship that makes this novel quite special. Buoy brings the sights, sounds and smells of war-era Vietnam to life as we experience the country through Dan's eyes. Cope and his brother, who's also in the country, are the wheelers and dealers who arrange trades for consumer goods like air conditioners and freezers, and the author's mention of Radar O'Reilly from MASH made me smile. 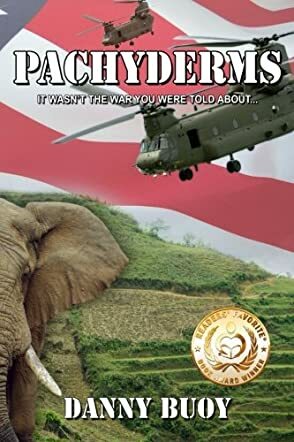 Pachyderms is a different type of Vietnam story from the others I've read. It reads like a memoir, and I had to remind myself on several occasions that Dan, Cope and the other servicemen I had come to care about were fictional characters. Pachyderms is most highly recommended. I read this story with great interest. I was an 18-year-old in 1966 and was also 'dazed and confused' with my enlistment. I can relate to many of Coobat's feelings and fears. The story is broken down into different parts, from Coobat’s first look at his new assignment to his service in Vietnam and his return to “the world.” The author’s characterization of his comrades and superiors is first rate. Most everyone that served has had a mentor and leader like Sergeant Copelet, without whom many would not have survived. The flow of the story is well developed and keeps the reader’s interest, wanting to know more. There were a few technical issues that a non-military editor would not have caught. These were insignificant and did not detract from this remarkable story. Pachyderms by Danny Buoy tackles the true story of soldiers who were put in an impossible position. The Vietnam war has been covered endlessly over the years since it happened in popular media, TV shows, movies ... you name it. However, even with how many times it has been covered, few avenues seem to be able to fully realize the reality of being one of those who served in the conflict. Within the pages of this book, however, you follow new recruit Dan Coobat on his first assignment that he has little formal training for, and a great deal of things to overcome. Danny and his band of brothers must create the 312th Aviation Company, where they must make do with what they have and struggle to make it home alive. Vietnam is one of those war times that seems to stick close to me. I had family that served and even to this day they do not talk much about it. So, being able to dive into this book, which really tells the true story and grasps hard onto the soldier's point of view, was a real pleasure. Danny Buoy tells this story with all the grit and sweeping backdrops you might come to expect in a war story. This book is touching and emotional from page one through to the end. I came out the other side having a whole new respect for why soldiers coming home from war often do not wish to speak about what they have been through and the choices they have had to make. If you would like to read a book that will humble you and make you see things in a new light, this is one for you.